(CNSNews.com) - The U.S. Department of Agriculture has published a report estimating that 35,891 food retailers around the country engaged in food stamp fraud, illegally “trafficking” more than $1 billion in Supplemental Nutrition Assistance Program benefits annually over the three-year period from 2012 through 2014. Some types of stores were more likely to engage in food stamp trafficking than other types, according to the report. Publicly owned stories did not traffic in food stamp benefits, the report said. “As there were no publicly owned stores found to have trafficked, privately owned stories account for 100 percent of all benefit dollars trafficked although they account for only 54.6 percent of all SNAP redemptions,” it said. 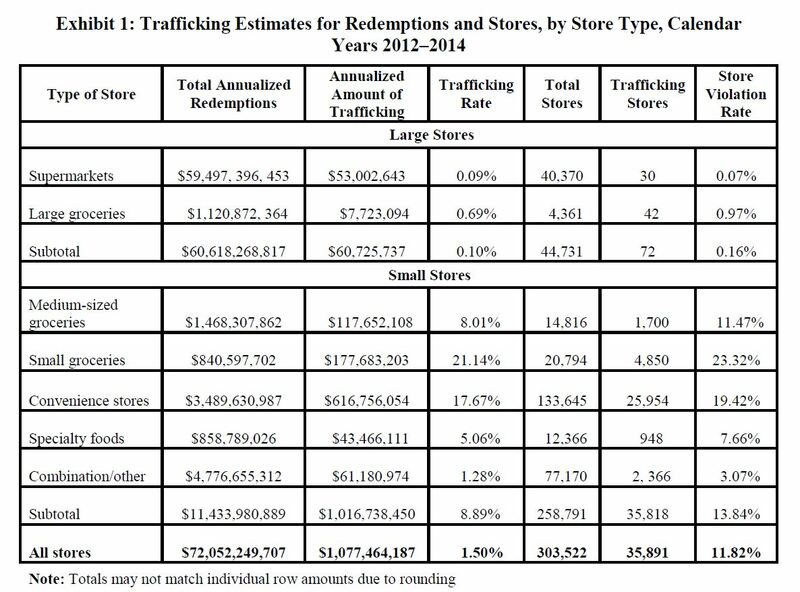 Larger stores were less likely to traffic in food stamps than smaller stores and “convenience stores” were the most likely of all to engage in trafficking. While only 0.07 percent of supermarkets engaged in food stamp trafficking, according to the report, 23.32 percent of small groceries did and 19.42 percent of convenience stores. “Trafficking was most likely to occur in the most urban areas,” the report said. A USDA summary of activity in the SNAP program in fiscal 2016 indicated that there were 1,845 retailers permanently disqualified from the program that year.